William Martin "Billy" Joel is an American musician and pianist, singer-songwriter, and classical composer. Billy Joel’s first hit song (in 1973) was "Piano Man". Since then Billy Joel has become the sixth best-selling recording artist and the third best-selling solo artist in the United States, according to the RIAA. Billy Joel had Top 40 hits in the 1970s, 1980s, and 1990s; achieving 33 Top 40 hits in the United States, all of which he singlehandedly wrote. He is also a six-time Grammy Award winner, a 23-time Grammy nominee and has sold over 150 million records worldwide. In 1992 he was inducted into the Songwriter's Hall of Fame, in 1999 he was inducted into the Rock and Roll Hall of Fame, was named MusiCares Person of the Year for 2002, an award given each year at the same time as the Grammy Awards. In 2005, Billy Joel received a star on the Hollywood Walk of Fame, in 2006 he was inducted into the Long Island Music Hall of Fame and in 2009 the Hit Parade Hall of Fame. Billy Joel "retired" from recording pop music in 1993 but continues to tour (often with Elton John). In 2001, he released Fantasies & Delusions, a CD of classical compositions for piano. In 2006 Billy Joel returned to touring after a three year break and has toured extensively ever since, covering many major world cities. In 2007, he briefly returned to pop songwriting and recording with a single entitled "All My Life" - written for his third wife Katie Lee Joel. In September 2007, Joel wrote "Christmas in Fallujah," a tribute to soldiers and a grim depiction of war. The song was recorded by Cass Dillon and subsequently by Billy Joel himself in a December 2008 live version that was released only in Australia. In March 2009, Joel resumed his popular Face to Face tour with fellow pianist Elton John. The tour ended in March 2010. Billy Joel decided to pursue a full-time musical career in 1964 after seeing The Beatles on The Ed Sullivan Show. He found and joined the Echoes, a group that specialised in British Invasion covers. The Echoes became a popular New York attraction, convincing him to leave high school to become a professional musician. He began playing for the Echoes when he was 14 years old. Among many of Joel's influences are: Beethoven, The Beatles, The Beach Boys, Bob Dylan, Ray Charles, Paul Simon, Elvis Presley and Elton John, amongst others. Billy Joel received the Grammy award for Record of the Year for "The Stranger" and Song of the Year, for "Just the Way You Are". Billy Joel’s album "52nd Street" was the first album to be released on compact disc when it went on sale alongside Sony's CD player on October 1, 1982, in Japan. Billy Joel has had a huge number of hits over more than 30 years. 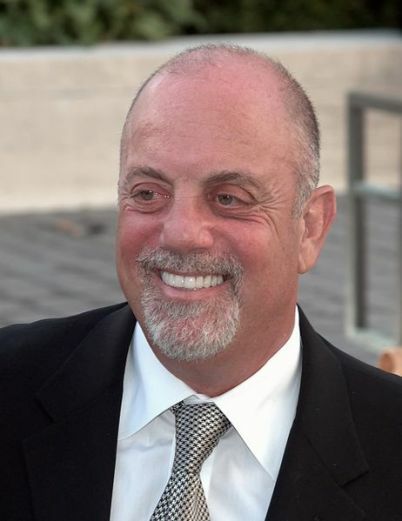 Some of his best known songs include "Piano Man", "Just the Way You Are", "Movin' Out (Anthony's Song)", "Only the Good Die Young", "She's Always a Woman", "My Life", "You May Be Right", "It's Still Rock & Roll to Me", "Uptown Girl", "Tell Her About It" and "We Didn't Start the Fire".